On the Sunday before the first day of school each year we host a chance for incoming students to meet his or her teacher and visit their classroom. This event helps acclimate students transitioning either as a new or returning student. All families are required to send at least one parent or guardian to our Mandatory Parent Orientation held prior to our first day of school. (Children do not attend this event). Parents meet our principal and other faculty/staff. Parents learn information about current procedures, policies, and expectations for their role as caregivers to our students. Additionally, parents also have the opportunity to meet teachers to discuss curriculum and classroom expectations for students. Every parent or guardian of a CTK student automatically becomes a member of our school’s PTO upon in enrollment in our school. Every family must volunteer to help the school succeed by serving a total of 16 Parent Participation Hours (PPH) per family each year. From that 16 hours, families must spend at least three hours helping volunteer at our Carnival in May. The remaining 13 hours of PPH can come from other volunteer work during the school year during various service opportunities. Each PTO meeting attended gives a family one PPH. The school and the PTO board ask every parent to attend the first PTO meeting usually at the end of August or beginning of September to gain insight on the possibilities to help serve our school during the year. Remaining meetings are held in November, January, and April. All students will have their individual pictures taken in early September to have inclusion in our yearbook. We will hold a retake session for any student requesting it or for any students that missed the first photo shoot in early October. For every quarter we hold a student assembly to go over perfect attendance and other awards, student activities planned, and to inform our student body about any current service projects in our parish community. The assemblies start at 2:15 pm and are noted on the parish calendar. Annually our Catholic schools in our local area gather at the Fort Smith Convention Center to hold a day of prayer for peace around the world during a rosary service. Our first through sixth graders go on this field trip. The event is typically held in early October. The school hosts two yearly parent-teacher conferences during the months of October and March to help parents and guardians gain insight to their child’s performance in school. Parents will signup directly with their child’s teacher prior to the conference time. CTK participates in this national event week to focus on preventing bullying and drug use. 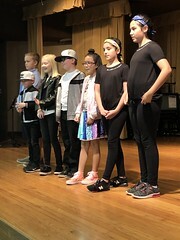 Students and teachers participate by dressing up, doing activities, working on related assignments, and engaging with guest speakers during this annual week in October. Click HERE for schedule of events for 2018! 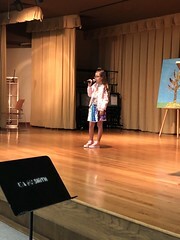 Our music teacher teaches our preschool through sixth grades musical programs to perform during the year. 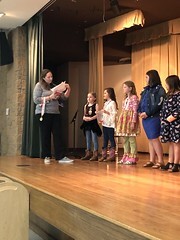 Our preschoolers – third grade present their own perspective programs in December each year with a Christmas themed presentation. 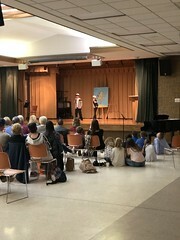 Our fourth through sixth graders present a play styled program in the month of May each year. 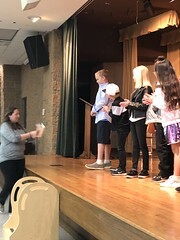 Our fourth through sixth graders compete in a school spelling competition to determine a student to move forward for the Sebastian County Spelling Bee. 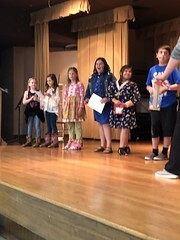 We have had many students from CTK win the Sebastian County Spelling Bee and as a school take great pride in how competitive our students are in this event. 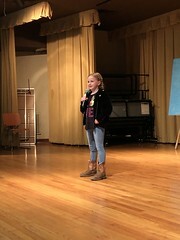 Our school’s bee usually takes place yearly in December with the county bee occurring in January. 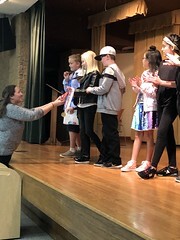 Our fourth through sixth graders compete in a school geography competition to determine a student to move forward in competing for the state competition. 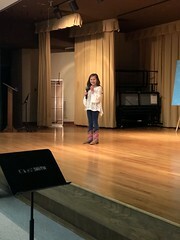 The geography bee typically takes place in January for our school competition. Students will take a class photo for the yearbook in January. No retakes will occur for the class photo. Catholic Schools Week is a national event highlighting the benefits of a Catholic learning environment. The PTO helps plan, coordinate, serve, and promote the activities associated with the week’s celebrations. The school hosts an open house night featuring school projects, hands on activities, and guests from the world of Science, Technology, Engineering, & Math (STEM). 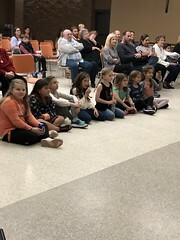 The school’s Student Council elected officers and classroom representatives host an event for daughters and fathers to attend featuring dancing, pictures, and refreshments. Students in first through sixth grade participate in a standardized testing to help gauge student success and retention of curriculum, yearly in April. The test provides one element of student assessment used at our school. Results are given to parents once they are received from Terra Nova. The school rewards our students at the end of the year with a fun-filled day of water sports and other activities during our Annual Field Day in May. All of our school events need the support our our Christ the King Catholic community as well as many of our Fort Smith and surrounding area partners. We welcome volunteers and donations for all of our events. For information on how you can attend, help, or donate to a event please contact the school office at 479-782-0614.